Maintaining the interest of students in a classroom is a real challenge, today there are many distractions and most people have become accustomed to immediately get what they want. And although it seems that in this regard the Internet has become an obstacle for education, the truth is that it is enabling people all over the world to educate themselves better. Even the leaders of large corporations and entrepreneurs have decided to create their own content online to train in it, which is why there are multiple platforms that offer this service and more on the rise. Quizlet is a famous one, a platform that offers the best service, both for teachers and students. Among its main features are the ease with which students can interact and the fact that the instructor can follow in detail the progress of the enrolled. But is by far not the only one. In this article, we will show you 5 equally useful alternatives to Quizlet. How to Select the Best Platform? Before choosing a platform to invest your time in, it is rather important that you know what to look for. Needs: choose one that adapts to your learning capacity, ability to pay and accessible from the devices at your fingertips. Environment: if the platform seems boring, with many distractions or too complicated you will end up leaving the site. Tools: each platform offers more or fewer tools for teachers and students, it will depend on you to determine if the one you chose offers enough tools for your goals. 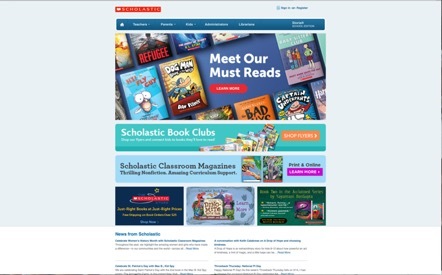 Oriented specifically in fostering the passion for reading in children, Scholastic’s mission is to help them learn through reading. -They think that independent reading is a critical part of children’s learning and growth, and with the support of teachers, parents and even schools, children who use Scholastic can choose the books they want to read and discover the pleasure and power of the reading. Signing up an account is quite simple and best of all free, you only need to access the registration section and put your name and email. Another story happens with the books, which you must buy access to. It is not clearly shown if there are promotions, in fact, to find out anything you need to communicate directly with a sales representative. In addition, there are more resources such as games, a news section, book blogs, elective information, printable lesson plans, message boards, and videos. For example, an innovative product is “The Clues”, a digital detective book that combines reading with interactive activities and cards, making reading a game. The material contained in this site covers pre-school and ages up to 18 years. Teachers will be able to use this site in their classrooms and supervise children, and parents have the responsibility to do the same at home. They also sell physical books and help organize fairs and book clubs in schools. Do you remember the chips or pieces of paper before exhibiting? They were relatively small and were used to place specific information that would help us remember the theme of our little speech. We can say that, based on that, cueFlash has developed an interactive site with ample content useful for anyone. Pleasantly it is a free service which can be used by people of all ages in order to prepare for a course, or by simple curiosity, although to create your own cards or cards you must register a user. The site is easy to explore, in fact, the design is terribly simple, to the point that browsing it could become boring, but it makes up for it with the quality and clarity of its content. cueFlash is an excellent platform for teachers of different levels (school, high school, and university) to perform non-contact evaluations, inviting their students to enter the site to perform tests, in fact, upon entering you will notice that most of the chips have names of courses or final tests. Headmagnet is based on research on memory, learning, and cognition. They model the memory of the user with an ACT-R cognitive architecture process, developed primarily by John R. Anderson at Carnegie Mellon University. This site is in constant development because as users generate more data on how they learn, they improve the system to increase accuracy and help you to study more effectively. 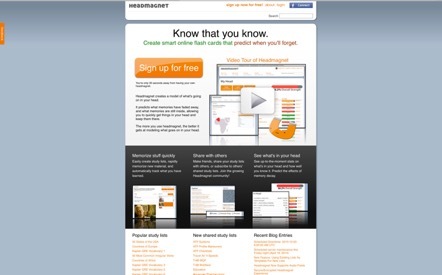 Registering on this site to study is completely free. If you already know what you want to study you can use the search engine or go directly to the subject of your interest if you are not sure how to educate you could be interested in the section of the shared study lists or the most popular study lists. With this platform you can study intelligently and focused, its function is to help you determine what information you are studying easily and identify what you tend to forget, helping you to study only what you forget. You can create your own lists of things to remember and learn them in a variety of ways that you can easily customize or create. A particular resource is the shared list section, where you can take the study lists that other users are willing to share instead of taking time to prepare your own list. By subscribing to these lists you will stay updated and if you add or change any element, they will automatically update showing when you focus your study sessions on learning new elements. Conceived to help students of all levels, StudyStack is online since 2002 and already has more than 2 million users. The diversity of study activities allows you to memorize data quickly without getting bored of using a single method of study. StudyStack also allows you, as a teacher, to enter data quickly once and create a dozen different activities for your students to memorize the facts. To finance and maintain operations while offering a free service is supported by advertisers, and most students and teachers prefer the free service, however, to avoid the distraction of advertising you can opt for the PRO membership, the Payment plans are $ 1.50 per month, $ 10 per year for students and $ 20 per year for teachers. You can, as a teacher, create your own activities when registering a user, and your students do not necessarily need to register a user to participate, although without registration they will have some limitations. While there is little interaction among users -as happens with cueFlash- it still offers great tools that allow diversifying teaching methods. 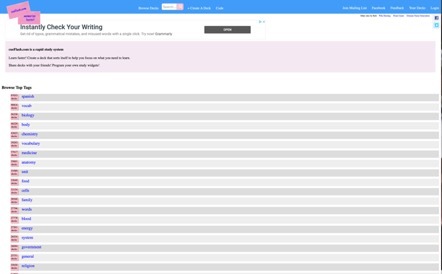 You can also copy -if you are a PRO user- or print the activities to take them into the hands of your students, which is especially valuable if there are students with low social status or access to the Internet is defective or complicated. Also, if you need additional information that is not answered in the extensive FAQ section, you can communicate directly with the technical team. 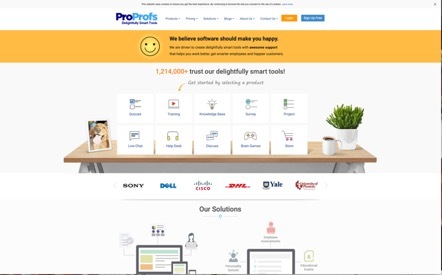 ProProfs is by far one of the best study platforms, hosts more than 1,000,000 pages in more than 70 languages and is a leading platform for online training and evaluation with an extensive library of professional tests and exams. Important companies like SONY, DELL or Mitsubishi, as well as renowned studio houses like YALE and DUKE have implemented this software in their training system. Basic, for $ 9 per month. Team, for $ 39 per month. Business, for $69 per month. Company, for $ 199 per month. Its goal is to develop software that makes its users happy and astonished instead of one that only does the work, so they are committed to working constantly on their platform, in addition, they offer immediate technical support through chat and calls. Since it is funded, they will operate in a way that is completely client-oriented. The platform is simple so that anyone is able to use it without problems, and its dynamic products include surveys, tests, games, help tables, live chat, among others. When it comes to trust and exposure, you may want to know that important media such as Forbes and The Wall Street Journal have made news and announced this study platform. Each of the online study websites we have presented has been implemented by millions of people, so you must decide which is best suited to what you need as a teacher, student, or person interested in training through the Internet by their own means. The most complete of our list is ProProfs, offering from free packages to business packages, but what matters the most is that you find the studying tools and content that you need to succeed in your goals.